Getting in and out of the car is easy, isn’t it? Not when you have twins to consider! That is two car seats, two wriggly babies, or tots, or toddlers to deal with. That is why it is vital to get a good twin travel system set up from the beginning. One that is going to work for you too, not just one that your neighbour’s cousin’s Aunt who had twins 20 years ago recommended. There are a number of options to choose from, so take some time to research what you think is going to work for you. Your considerations should be, how much you go out, where you go when you are out, and your home/car situation. Being a single Mummy, money was tight. But I knew that I had to manage twin babies on my own, and I knew I had to be kind to myself and go for something that would work efficiently. My point of reference was always this: If I’m out with two tired, hungry, screaming babies and it’s pouring with rain, what will I need to make life easier and get us all to where we need to go with the least amount of fuss and stress? Because people will always need quality baby items, I knew that I could sell the things that I only needed for a few months, which would help fund the next round of items I needed. So, price was quite low down on the list of considerations. The first boxes to tick were safety, functionality, simplicity and twin-friendly. I knew that I needed to be organised, so I used to have checklists everywhere. It is probably why I love creating checklists for you, my Twins & More customers! When you have twins, your window of opportunity to do anything is pretty small, so don’t waste that precious time trying to think about what you need. Preparation is key. 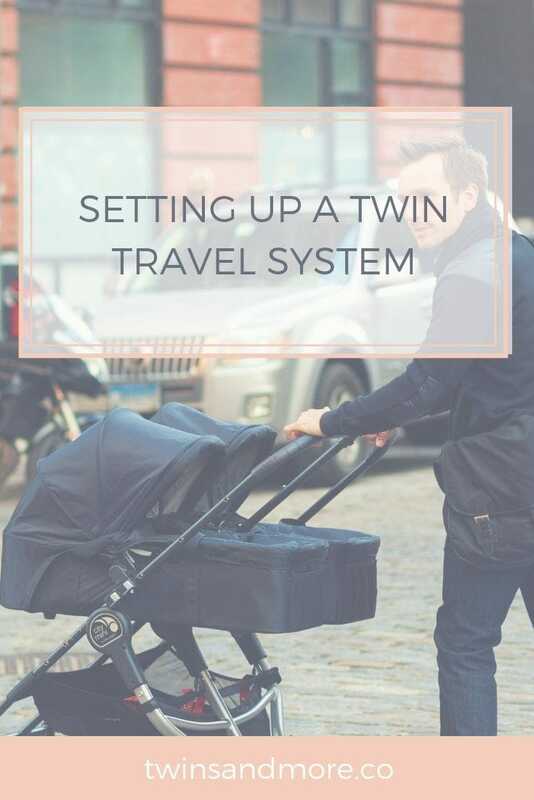 What is a Twin Travel System? The term twin travel system is not trying to trick you, it is exactly what it sounds like. It is a practical and efficient system used when you are travelling with twins. Whether it be 5 minutes up the road to grab a well needed coffee, to swimming lessons, or a long Christmas road trip, you are going to need to be prepared for how you will get there safely and with some shred of sanity left. The travel system is the entire set-up for when you are on the move with your twins. So that includes, capsules, a twin stroller, bassinets, twin carriers… anything you are going to use to help you transport your precious cargo. It is called a system because it all works together cohesively. The capsules lock into attachments in your vehicle, and into the twin stroller. The bassinets easily click in and out of the twin stroller. It is designed to make travel with twin babies so much easier. Every second counts when you’re travelling with twins. While you are buckling one in the car, the other could be getting into mischief (or drenched with rain), so it is important to choose a travel system that is quick and easy to use. It was one of the most stressful things I found as a new mum with twins: always having to think about the safety and wellbeing of two babies. The twin stroller will form the base of your twin travel system and will be the most used twin item you will purchase. It is also likely to require the most investment so it pays to do your research and shop around for the stroller that will suit you and your family. 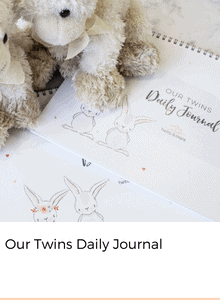 I am not going to go into too much detail about purchasing a twin stroller in this article as I have another article (with a handy checklist of course) dedicated to that topic. But what I would like you to consider, is choosing a brand that is compatible with, or has adapters for, all the other elements that will make up your Twin Travel System. There is no escaping the fact that you will need 2 capsules to transport your babies in the car. Twins cannot travel in a vehicle unless they are in their own car seat. And a capsule is the best and safest method in the beginning. A capsule is a car seat designed especially for infants. It is named because it looks like a capsule. When they are in it, the capsule protects your baby from all sides. Apart from the safety and practical aspects, one of the most amazing things about a capsule is that it has a handle! On the face of it, that might not seem like much, but let me promise you, life without those handles would be much harder! Strap your babies into their capsules, and then using the handles, you can pick up one in each arm. Top Tip: You will find capsules the easiest way by far to transport your new-born twins when you are running quick errands such as popping into a store to get the milk, visiting friends or going anywhere that doesn’t require your huge twin stroller. When you are shopping for capsules it is essential that you keep this in mind and go for a capsule brand that is light and compact otherwise it will be impossible for you to carry them once they grow. Your capsules also come with the ability to click them into a compatible twin stroller so it is essential that you consider your twin stroller and capsule compatibility when you are making your purchases. Anything you can do to make getting out of the house with your twins easier (especially in the early days) will make an enormous difference to your sanity and confidence. Having capsules that will click into your twin stroller will speed up the carpark process, and who doesn’t want greater safety in the carpark when you have two little lives to protect. Being able to leave them in their capsules and simply click them onto the stroller also means that you don’t have to move them when they are sleeping. Just be mindful not to leave your babies in their capsules for extended periods of time. The position they are placed in within a capsule can affect their breathing. Babies can remain in their capsules until they are around one-year-old – as long as they safely fit, or until it gets too heavy to carry the capsules. Then you will need to change to a car seat. A capsule base is a fixture that you fit into your car while you are using your capsules. The base portion remains in the car and you can clip the capsule on and off. This means that you don’t have to worry about seat belting the capsule in every time you take it in and out of the car. Let’s not kid ourselves, you will be doing that a lot! You will have to buy a base that is compatible with your capsule. Some come as a package deal, and some you have to purchase separately to the capsule. Top Tip: Capsule bases are an absolute godsend with twins as you don’t even need to put the second twin on the ground while clicking the first twin into the car. And it’s quick. Many twin strollers come with a bassinet option and this can be a great idea for twins for the first 4-5 months, especially if you enjoy walking or wandering the shops. They can also be used as a portable day sleep option inside for those days they just won’t settle and need the gentle rocking and swaying that only a pram can give. Top Tip: As the bassinets are only used for a few months you can usually get a good resale value from them to help fund the next purchase. Choosing all the components of a travel system can be overwhelming due to the sheer number of options available. It can be hard to know which brands are the best. Take your time, research and if you have the opportunity, ask some other twin mums. There are several considerations when choosing the components of a travel system. So, think safety, functionality, and if it is going to make your task of getting two babies out of the house and to your destination as easy as possible! Can You Breastfeed Premature Twins?